The popular program features content on careers in the building fields. The program will be featuring some leaders in the field who can talk about the growth of the industry, and how new technologies and innovations help broaden the field for potential employment. Viewers will soon be able to see Laurence Fishburne, host of "Information Matrix," in a new segment on job opportunities in the construction and building industries. There will always be job opportunities for those working in construction-related fields. 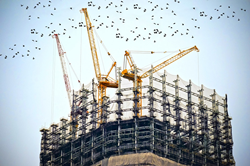 New buildings will need to be built, old buildings will need to be torn down, and existing buildings and homes will need to be remodeled or repaired. Along with promising job opportunities, there is also the potential to earn very good pay in this industry. The program will be featuring some leaders in the field who can talk about the growth of the industry, and how new technologies and innovations help broaden the field for potential employment. Created to help educate consumers, viewers can tune in to hear expert advice and opinions on job opportunities in the construction and building industries. Those looking for an exciting career path with good wages will not want to miss this segment of "Information Matrix."